another year with foodiesgarden comes to an end and it was a turbulent one! we moved back to berlin and thereby also back to having our garden almost in the neighborhood. but as some of you might have recognized, this unfortunately did not lead to more blogposts about gardening and cooking this year. because in addition to the moving, we both took some exciting steps in our jobs and therefor sometimes the food-writing had to step behind family and work. so now we are happy about that break we all have for christmas and new year and hope you all have some holidays too, enjoy the time with your beloved, take time for a book or simply put your legs under a blankie. and of course enjoy some good food and goodies. this year our christmas baking was a bit limited. but at least there was one project we successfully accomplished: quince paste. 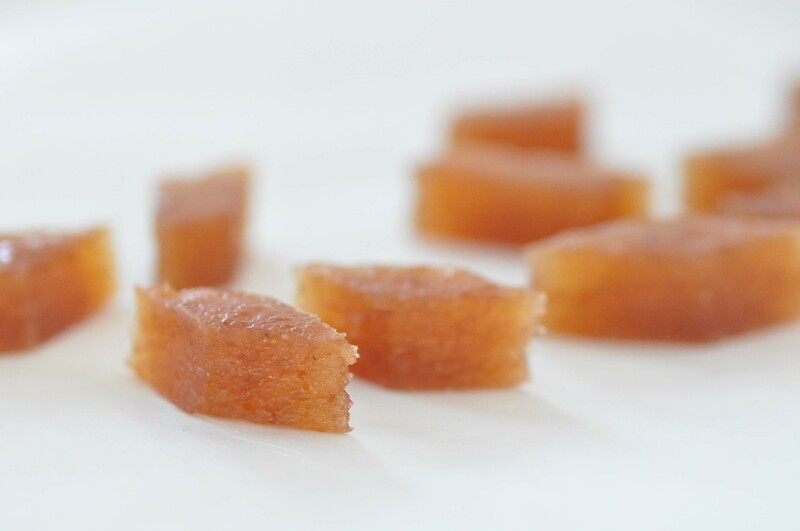 quince paste is widely known in many regions of the world and so it got many names: quittenkas, quittenbrot, quince cheese, membrillo and so on. it is quite some work, but the rich harvest of quince we had, kind of forced us to find recipes with huge amounts of quince. so we decided for quince jelly and quince paste. one is the by-product of the other. and both wonderful christmas presents for the family. wash the quince to remove the fluff of the quince. you do not have to peel them or to remove kernels, simply cut the quince as they are into smaller pieces. pour them in a large pan and cover with water. cook until soft. pour some fine cotton or kitchen towel in a large sieve to strain the quince. allow to set for halve an hour at a minimum. the juice can be further processed to quince jelly. for the quince paste you need only the strained quince. pour the strained quince through a sieve, a food mill or the kitchen aid strainer for smoothies. wight the strained quince and combine with the right amount of sugar. bring to a boil and cook until it starts to thicken like you do for jam or jelly. spread the mixture onto baking trays lined with baking paper. put it in the oven and dry it at 50°C for a couple of hours. probably you have to turn the quince flat bread once or twice during drying process. cut into pieces and let dry it a bit more if necessary. you can make breaks during drying and continue the next day until you’re happy with the texture. quitten waschen und den flaum von der schale abreiben. samt schale und kerngehäuse in stücke schneiden. in einen großen topf geben, mit wasser bedecken und kochen bis sie weich sind. ein sieb mit einem baumwolltuch oder küchenhandtuch auskleiden und die quitten darin abtropfen lassen. mindestens eine halbe stunde stehen lassen. der sagt kann zu quittengelee verarbeitet werden. für den quittenkäs braucht man lediglich die gekochten früchte. die quitten werden als nächstes durch ein sieb oder eine flotte lotte passiert oder durch den passieraufsatz der favorisierten küchenmaschine. je nachdem geht dieser schritt schneller oder langsamer. die passierten quitten wiegen und mit der entsprechenden menge zucker vermischen. aufkochen und so lange kochen, bis die masse beginnt zu gelieren. die quittennasse auf mehrere mit backpapier ausgekleidete backbleche verteilen und bei 50°C im ofen trocknen lassen. dieser teil kann mehrere stunden dauern, aber jederzeit unterbrochen und fortgesetzt werden. den quittenfladen kann man zwischendurch auch mal wenden, damit er gleichmäßig trocknet. wenn die gewünschte konsistenz mehr oder weniger erreicht ist, die fladen in stückchen schneiden. gegebenenfalls kann man sie jetzt noch mal einen tag offen stehen lassen, damit sie noch ein wenig trockener werden. This entry was posted in recipes, winter and tagged quince, sweets by The Cook. Bookmark the permalink.